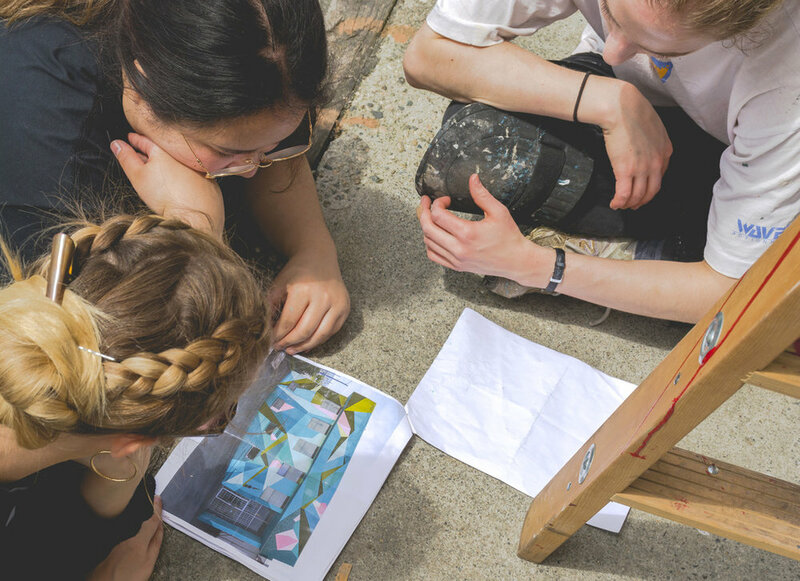 This summer, Grad 19 students Ian Kaart (designer and project lead) and Cynthia Tran Vo (co-designer and painting) designed a mural for Vancouver Mural Festival 2017. IDEA School of Design students from 2018, 2019, and 2020 graduating classes helped paint the mural. Grad 19 students looking over preliminary comps. In May, 2017 the "Anna’s Hummingbird" was officially named Vancouver’s bird mascot. The Anna’s Hummingbird is described as “classy, urbane, and stylish with the heart of a tiger.” The bird flies at a very fast rate which mirrors the hustle and bustle of Vancouver city life, and has vibrant magenta and green/teal colours. Grad 19 students prepping the site. The location also inspired us. Since the area is known for its Japanese population we picked cherry blossoms and origami as points of reference, resulting in a mural painted as geometric shapes in greens, blues and teals, complemented by cherry-blossom pink. 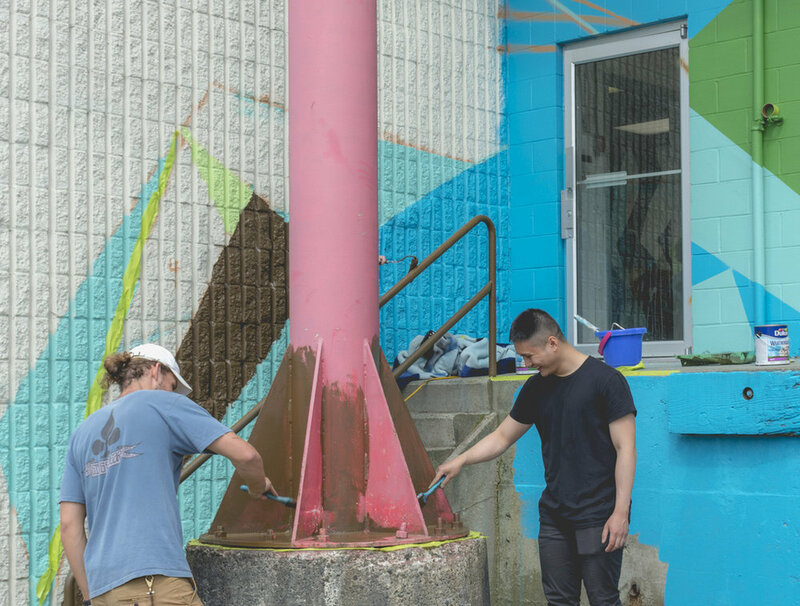 Project lead Ian Kaart and grad 18 student John Dimal adding some pink. The colours we chose fit well with the nearby Port of Vancouver, with its teals, blues, and ocean greens, its orange cranes and its colorful shipping containers. Grad 18 student Danielle Vallee demonstrates good safety practices. 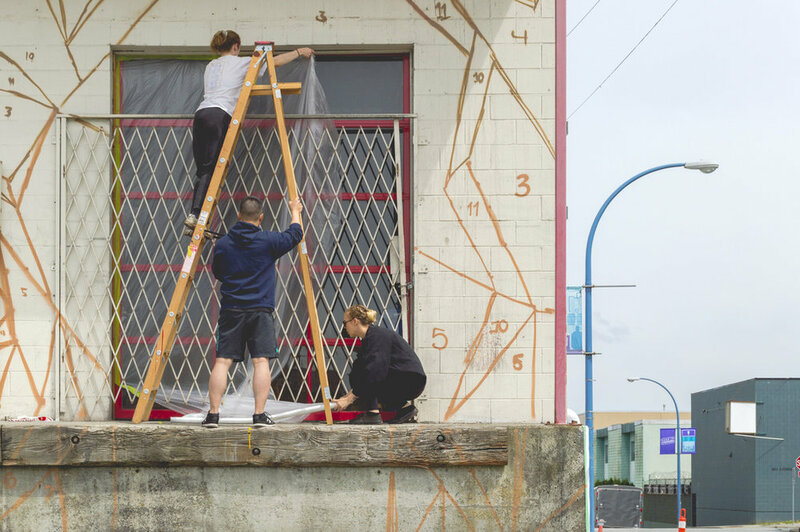 A total of 17 IDEA School of Design students (from 2018, 2019, and 2020 graduating classes) helped paint the mural which is located at Campbell and Cordova (right where Cordova meets with Powell in Strathcona) on the CBR Productions building in Vancouver, BC. Two hummingbirds face each other in flight while cherry blossoms dance across the mural, paying homage and respect to the Japanese Canadians who fought in WWI. The geometric shapes reflect origami paper craft; the bright teal/green background creates an interesting space for the birds to engage with; and the lightness of the colours help the birds and branches come to the foreground of the mural, creating depth and interest. A wonderful group effort!